There are two Malaysian government organizations which regulate and license Bitcoin brokers in Malaysia, the Securities Commission of Malaysia and Bank Negara Malaysia. We did a search for a Malaysian licensed bitcoin broker, but could not easily find a broker regulated in Malaysia. You can search yourself for Malaysian registered brokers here. Most of the international Forex brokers are licensed in Australia or the United Kingdom, and although they accept Malaysians, they use their primary license instead of getting a local license. The first step in choosing a bitcoin broker is to make sure the company is licensed and regulated by a reputable government agency. We have see companies based in Bulgaria and Vanuatu offers their services to clients worldwide, and those companies are actually scams. Investors should always seek a bitcoin broker with a valid authorization from the Financial Conduct Authority in United Kingdom, or from ASIC in Australia. WARNING: There are many unlicensed brokers that try to persuade Malaysians to open accounts with their firms. They will even lie and say that they have a license, or that they don’t need a licensed, because Crypto Currencies are decentralized. You should see the complaints about unlicensed brokers look here. 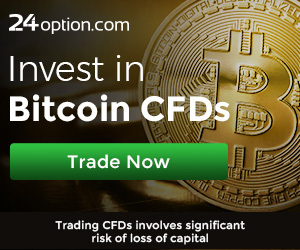 24Option is a very popular European licensed CFD broker that offers trading on Bitcoin, see here. Their Crypto Currency asset list is very inclusive, and they have “Mini Contracts” which make it that you can start a position in Bitcoin with only $100. Start with a Free Demo Account at: 24option.com. Vantage FX is a large Australian broker that is licensed by ASIC. Besides the tight spreads they offer on many Fiat currency pairs, they now have available CFD trading on Bitcoin, see here. There are hundreds of bitcoin brokers that you can invest with! Since many of them look identical, just make sure your broker has a valid license! You may not realize this, but the biggest scam today in the Bitcoin industry has to do with fake trading systems, which promise to make you thousands of dollar using a secret algorithm. The truth is that none of these robot that advertise on Facebook or Fake News sites actually work. They are just part of a biggest scam. Recently, we found an automated trading software for Forex, which works with a few licensed brokers. Go read about the FX Master Bot. Another popular choice for a Bitcoin investment fund is from the Social Trading broker eToro. We looked for a licensed Bitcoin broker whose website and trading platform is translated into Malay and the best we found was FXTM. ForexTime is one of the largest CFD brokers in the world and they are licensed in Europe and South Africa. Malaysians who speak Chinese / Mandarin will find many brokers that are specifically made for the Chinese speaking investor.